Why does anyone need bulky noise-cancelling headphones? With the appearance in 2014 of the Bose QC20i noise-cancelling earphones, the technology has been shrunk. Why fight it? 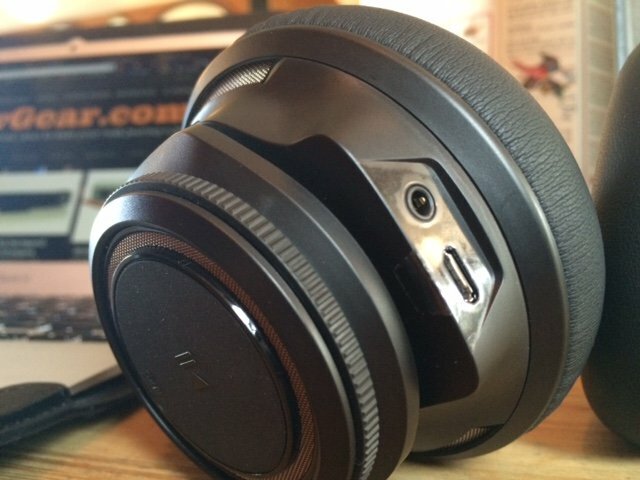 The answer is (far) superior music quality, which the Plantronics BackBeat PRO has in spades. The Plantronics BackBeat PRO has something else that the Bose QC20i doesn’t; Bluetooth. Although pairing is so, so easy – press the side of the right-hand ear-cup and switch-on Bluetooth on your phone – owners of Android phones can link via the fancy (but pointless) ‘one-touch’ NFC feature. The Plantronics BackBeat PRO weigh 339g, but they are superbly made. The soft silicon, soft leather and finely-padded ear-cups are just so comfortable; they’re made for long journeys (and phone calls, too). Charging-up via microUSB (there’s a slot on the bottom of the right-hand ear-cup alongside a 3.5mm jack for listening the old-fashioned way, over the wire (also in the box), the Plantronics BackBeat PRO are brilliantly designed with controls placed in areas that are naturally easy to find without having to take-off the headphones. Tap the left-hand ear-cup to play and pause music, twist a dial on either ear to alter the volume, and flick a switch on the back of the left ear-cup to switch on ANC – Active Noise Cancelling. Even better, the headphones pause if you take them off mid-way through a song. For travel there’s a pouch of high quality; made from soft but strong fabric, it clasps at the top using a wired rim and Velcro. The ear-cups both bend to lie flat, to, making the easy to slip into a slim carry-on bag. Before we get on to the quality of ANC, consider the Plantronics BackBeat PRO without it. They’re fabulously musical, with refined low frequency sound meshed perfectly with treble detail and a full mid-range … and just so relaxing to wear. It’s rare to find high-end active noise cancelling headphones that work at all without the ANC mode engaged. However, flick that switch and the only thing changes is that you’re now listening to superb sonics with zero background noise. Wow.The battery lasts about 60 hours, too. Blimey. Not degrading sound quality with ANC engaged is also rare, while the difference between streaming music over Bluetooth (which stretches over vast distances – useful if your hotel suite is especially large) and over a cable isn’t hugely noticeable. Whether you’re allowed to use Bluetooth or not on long-haul flights (strictly speaking, you’re not, though it’s rarely enforced), the Plantronics BackBeat PRO gives a range of options that, crucially, don’t negatively effect sound quality. We’re still huge fans of the Bose QC20i for their pocket-size, but the Plantronics BackBeat PRO are hugely better judged on sound quality. If that’s important to you, and luggage space less so, the Plantronics BackBeat PRO are hard to beat at 30,000ft.